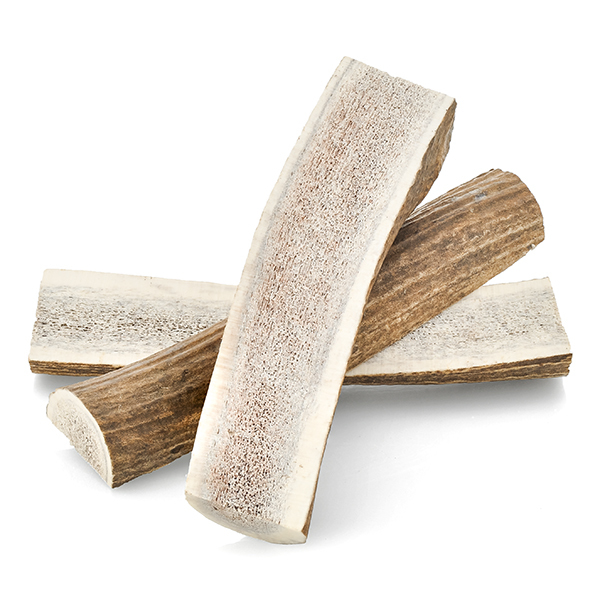 We are now offering Elk Antler Chews. Raised in the heart of central Alberta, these antler chews are naturally shed and ethically harvested. *Disclaimer: Seller is not responsible for any teeth damage or health problems associated with antler chews. Please supervise your pet at all times when using this product. -the antlers are ethically harvested. It is naturally shed every year and a new antler grows again. It is considered a renewable resource. -Antlers are bones that develop from and are cemented to two protuberances called pedicles on top of the skull. During growth, the antlers are covered by a furry skin called velvet. A network of blood vessels in the velvet supplies the growing antlers with the specific nutrients needed to develop. Growth and hardening of the antlers is completed in late July or August. In August, increased production of testosterone cuts off the blood supply to the antlers and velvet. The velvet dies, dries up, and peels away. Increased daylight in the early months of the year leads to the release of testosterone which stimulates the new antlers to begin growing. In the winter, the reduced daylight leads to the decrease of testosterone release and the shedding of antlers takes place. The antlers are used to set up hierarchies among the males during the mating season, and to impress the cow elks.